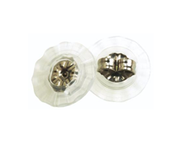 Blomdahl Medical Plastic Flower Pendant features a fixed Swarovski Flower with a hook in pure Medical Plastic. The setting of the flower is 6mm. This nickel free earring is available in five colors: Crystal, Aquamarine, Fuchsia, Light Rose, and Violet. A style for the BEST healing! During the first year after ear piercing it is important to keep the holes clean, dry, and airy. After the healing period (6-8 weeks), one can take out the piercing jewelry and put in other jewelry. But it takes up to a year before the holes are completely healed and the skin formed inside the hole is thin and delicate. When changing earrings it is easy to damage this skin which can result in an infection. Therefore it is important to keep the holes clean, dry and airy, even after the initial healing period. As the first choice of earrings after changing, our new "airy" earrings with a hook in pure medical plastic are a really good alternative! Blomdahl plastic earrings with backs made a huge positive difference for my child's sensitive ears. We recently got a pair of these pendants and they are even better. Back to get another pair today! My daughter's ears were pierced 2 months ago, we used the rapid healing solution from Claire's for 3 weeks, and when we stopped as instructed, they either became infected or were showing allergic reaction to the white gold plated earrings. We were then instructed to put a gel medicine on her ears for a week, and take her earrings out. Well rather than take the earrings out to let her piercings get some air that the studs were not allowing for, I found these beauties! They arrived the day we finished the gel med, she showered that gunk off and we put these in. Not only am I sure that she will not have an allergic reaction to the plastic, the piercings also are getting plenty of dry, airy time, which is helping them heal. She was nervous about sleeping in them, but they don't bother her, its been three days and nights. All is well so far. They are really cute. The backs of the earrings are difficult to see so keep track of them, they go on easy enough, yet hold strong. They are a soft plastic, not rigid. The packaging was sturdy, cute and informative. We are happy with them! They are so much prettier on! The crystals look awesome and they are the only earrings my daughter can wear because she is allergic to everything, but even if she wasn't I would still buy these!